Is it possible for kids to eat too much fruit? Have you ever wondered why it can be an uphill battle to get your kids to eat their veggies, but they will quite happily munch on some juicy berries? Well, thanks to the natural sweetness of many fruits, most children are a big fan. But while fruit is packed full of vitamins and antioxidants, turns out there is such a thing as eating too much of it, especially if it starts to replace other foods in their diet. In fact, less than one per cent of children eat the recommended number of serves of vegetables on a daily basis. While your child’s taste buds are developing, it’s important for them to be exposed to vegetables in their natural state, so not to set up unrealistic expectations that veggies (and other foods) are sweeter. This could ultimately create challenges around future veggie intake and potentially even result in fussy eating behaviors. This is especially true when it comes to introducing solids. Babies need to be given the opportunity to experience the natural taste of less-sweet vegetables such as broccoli and cauliflower, before sweetening them with pear or apple puree. Teaching babies and young children to enjoy a wide range of flavors and vegetables is important and this provides the perfect opportunity to do just that. In saying this, fruit often gets lumped with other high-sugar foods, and while it’s true that fruit contains the intrinsic sugar fructose, and that some fruits contain more fructose than others (like mango, banana, lychee, dates, cherries, and grapes), many fruits have a low glycemic index such strawberries, blueberries and kiwifruit. So, when it comes to giving children fruit as a snack or dessert, I’m all for it, especially if it’s replacing a refined sugar snack. While fruit is a great source of carbohydrates, fiber, minerals and vitamins A, B and C, unfortunately it has little protein and virtually no fat, which are both essential for a growing child. This is why it’s important not to use fruit as a child’s main tummy filler. It’s best to pair fruit with a protein and healthy fat that will keep children satiated for longer. Try apple slices with some nut butter, berries with yoghurt or ricotta cheese or half a banana with a handful of sunflower seeds. How much fruit should my child be eating? The recommended guidelines for children are two serves of fruit per day. But if your child is active and plays sport, I recommend an extra serve of fruit as long as it doesn’t replace other foods in their diet. One serve of fruit is around half a cup. To give you an idea of what that looks like, this roughly equates to: one medium apple, banana, orange or pear; half a cup of berries; two small apricots, kiwifruit or plums; one medium-sized melon wedge; one cup of diced or canned fruit (with no added sugar) or one and a half tablespoons of dried or freeze-dried fruit. Once your child has had their two-three serves of fruit per day, offer veggies as a snack instead. An engaging way to offer this may include some vibrant fresh veggie sticks with a delicious dip, like a homemade hummus or tzatziki. Including a vegetable-based dip will not only add important protein to their diet but boost their overall veggie intake too. How can I encourage veg intake alongside the fruit? There are a few different strategies that you can use to include more vegetables in their daily snacks, meals and perhaps even alongside their beloved fruit. 1. Include vegetables in their fruity dishes. Smoothies are a fantastic way to boost their veggie intake, alongside other nutritious food groups like protein and healthy fats. Adding some beets, carrots, a handful of spinach along with the fruit, some coconut milk, yogurt and chia seeds will increase the nutritional content substantially. Making smoothies is also a great way to encourage children to be involved in the kitchen. Let your child pick a range of fruit and veg and see for themselves how different ingredient combos work together to make a delicious drink. Can’t think of the perfect smoothie blend? I feature a range of nutritious recipes in my book. The great part about smoothies is that they’re incredibly versatile in terms of flavors and ingredients and any leftovers can also be frozen into popsicle moulds for a popsicle re-feature on another day. 2. Get cooking with your kids. Children learn through play and experience and there’s no better way to expand a child’s repertoire than by cooking delicious meals together. Not only is it fun and engaging for children, but it’s also an important teaching tool for all ages. Better yet, for time-poor parents, it’s an excellent way to combine play with the daily routine of meals. Children also learn to accept new foods through role-modelling, repetition, and exposure and there’s no better way to expose children to a variety of ingredients than by choosing a recipe that you and your child would like to prepare together. Children love to eat what they have helped to make. Some of our Wholesome Child favorites to make with your little ones includes our vibrant Beet Buckwheat Pancakes and Fruit Mince Pies. Both of these recipes are packed with nutritious ingredients with both fruit and veggies alongside each other and are an excellent opportunity to cook with your family. 3. Grow your own, or visit a local community garden. Exposing children to the wondrous concept of earth-to-table is a great way for them to become engaged in eating more veggies. But don’t worry, you don’t have to have a huge plot of land to grow your own veggies – often a windowsill, patio or balcony will be ample space to sprout herbs, strawberries or even tomatos. Involving children every step of the way, from choosing what to grow, to packing the soil, to watering, weeding, and picking will do wonders. 4. Use your imagination and embrace creativity. Get creative with serving fruit and veggies alongside each other in the form of simple shapes, perhaps even with a storyline or theme. With a few simple cuts of the knife, you can turn an apple into a dinosaur with celery spikes that your child will munch down in minutes. Allow your child to make pictures on a plate from blueberries, carrot sticks, grapes, cucumber slices, slices of strawberry and some celery. 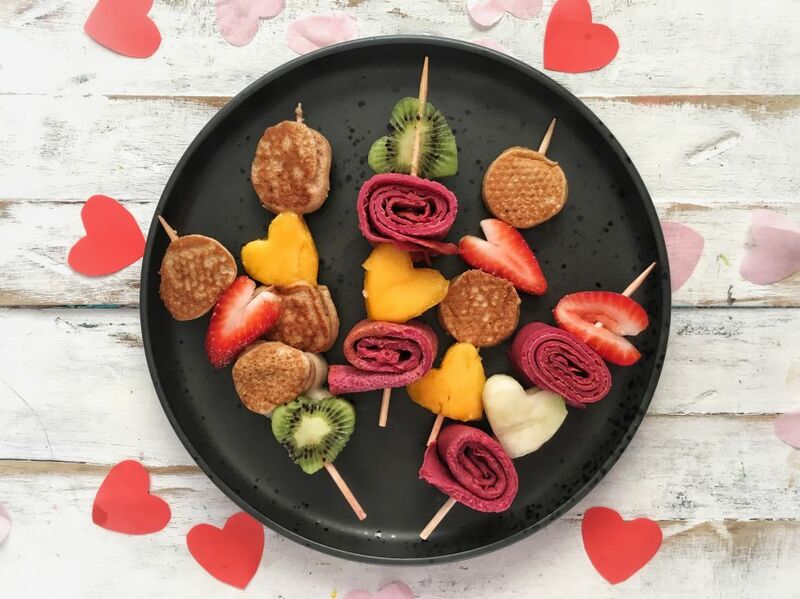 You could even make some vibrant fruit and veggie skewers, allowing your child to create these themselves from a selection of different fruit and vegetables. Let their imagination (and appetite!) run wild. Enlist the help of a ‘reward’ chart so your child feels a sense of achievement when they’ve eaten an agreed ‘fruit and veg’ combination. At the end of the week, once achieved, they could select from a pre-agreed range of fun family activities like a trip to the beach or local park, a new sheet of stickers or even a day out at the zoo. 5. Make salads and veggies readily available. Keeping some cut up slices of vegetables in the fridge at eye-level serves as a powerful desensitizer and prompt for both children and adults at snack time. What the eyes see, the tummy wants – so by removing less desirable snack elements from both the fridge and the pantry, it will be easier to make healthy choices. Exposing children to a diverse range of vegetables and allowing them to learn to expect vegetables at snack and mealtime is important. As with everything, persistence and perseverance are key. Including vegetables in the daily lunchbox and ensuring that adults model positive healthy eating habits at family meals also go a long way towards making progress. 6. Manage your own expectations. Rather than getting into a power struggle over veggies (commands, orders, threats, punishments, and bribes) try to ensure that the emotional environment at mealtimes is positive. Often, simply giving your child their veggies and acting as if you don’t mind whether they eat them or not can work well. Don’t forget to praise your child for trying small amounts of new veggies. Over time, continuing to do this will lead to familiarity with the new vegetables and a greater desire to eat them. Also, discuss the health benefits of eating veggies with older children in a fun and engaging way – try and avoid lecturing them and don’t forget to mention that they’re delicious too! Resist the urge to force a child to eat when they’re genuinely not hungry. Instead, look over the day and work out if they had a big afternoon tea, what they ate at their grandmother’s house in the afternoon or perhaps there was a birthday party at their kindy? Persistence, perseverance, and patience are all key elements in encouraging more veggies in your child’s diet. It’s definitely an ongoing challenge but it’s so important and worthwhile for their lifelong health and well-being. Crack the Easter code with these foodie tips! Do your eating habits affect your child? 3 Choccy Treats for World Nutella Day! 3 Nutritionist-Approved Family Meals For Under $15 Each! Shop right to head back to school! 3 Meals, 1 Hour – Let’s Cook! Get your kids in the kitchen for Thanksgiving! Sneaky Veg for Thanksgiving: Good Idea or Bad Idea? Have a Sugar-Free Halloween with Ease! 10 tips to beat fussy eating! Can you avoid food poisoning? Does your child snack too much? Is there such thing as good fat and bad fat? Allergy-friendly chocolate the whole family can enjoy! The formula for packing the perfect lunchbox! How to pack a healthy lunch your kids will actually eat! Boost Your Children’s Immune System During the Winter Months! The Wholesome Child Book – Help Make it Happen! Why Choose Organic Food For Kids?